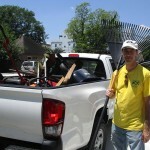 Borrowed truck with Make Houston Beautiful tools. 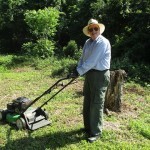 Volunteer Mike Hill. 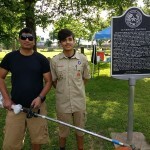 Descendants of Olivewood president Margott Williams; Thora Qaddumi, committee member; Asher Joseph, Eagle Project. “Flower Ladies” and committee leader Andrea Slack, right. From left, Holly Furgason, Lisa George, Ahlene Shong, Thora Qaddumi, Ginny Simmons. 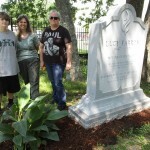 Landscaping First Church of Pearland’s monument for Lucy Farrow, “Mother of Pentacost.” Work by Scout Joe George, 12, Lisa George. 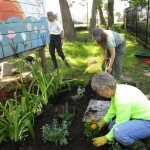 Plants donated by Holly Furgason, right. Dumpster destination. Shannon Molina, 14. 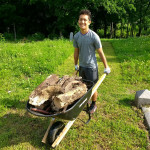 Eagle Project adviser Robert Shong. 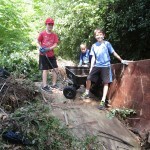 Cub Scouts haul debris to dumpster. From left, Chris Crawford, 10, Nathan Row, 7, Dallin Row, 9. 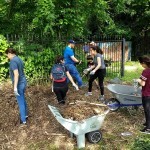 Student volunteers. From left, Darya Viles, 15, Ariana Viles, 15, and Valeria Serrano, 16. 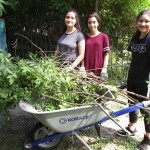 Darya and Valeria attend DeBakey High School for Health Professions. Ariana attends Westside High School. 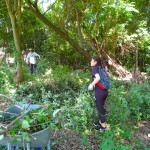 Clearing heavy growth near the White Oak Bayou. 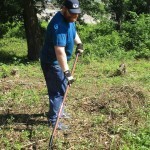 Clearing away a big pile of debris. 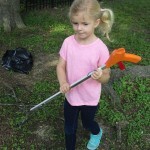 Picking up sticks. Alene Thompson, 4. 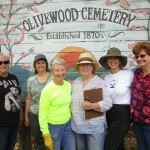 Beautifying Olivewood Cemetery. 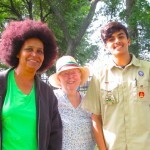 From left, Ginny Simmons, Lisa George and Ahlene Shong.